Most parents know all too well about the changing interests, hopes, and dreams their children have while growing up. One day they want to be a doctor, the next a star basketball player, and the next a famous musician. It’s all part of discovering gifts and talents. That’s why parents often choose inexpensive options when buying their child’s first musical instrument. 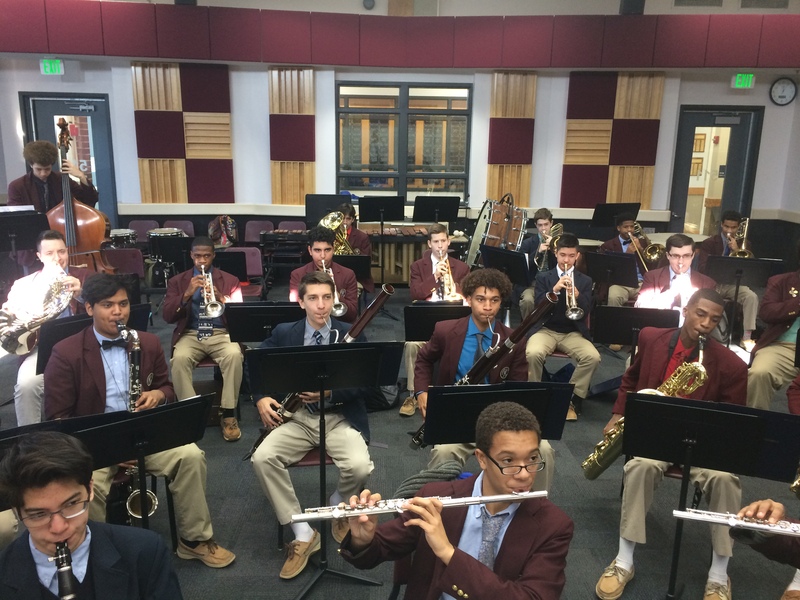 However, a recent grant to DeMatha Catholic High School reminded us of the importance of high-quality instruments once students are sincerely interested in honing their talent. As with many high schools, DeMatha bands compete in some highly competitive events. “If you’re at NASCAR you won’t race with a Volkswagen Beatle,” Roper explained. The new Conn 8D French Horns replaced instruments that were over 25-years old and had problems that were not correctable. The new French Horns are an expensive instrument, upwards of $4,000 apiece, and are not something that schools expect students to provide. Grants and donations are a big part of sustaining a high-quality band and orchestra. Conveniently, as I spoke to James Roper another music student passed by his office. Jesse Parham had experienced using a low-quality student instrument and then upgrading to something far better. Another perk is that professional model instruments don’t lose their value over time. They gain value. So, it has better sound and is a better value over the long term. I asked James if DeMatha was in need of other instruments as well. “Euphoniums and then bassoons, which are $7,000 – $10,000 a piece, are on my list” he explained. The gift of a high-quality instrument is immeasurable. It piques the student's interest leading to longer and more enjoyable practice sessions. For a band, quality instruments enhance their performance and better showcases each musician’s talent, contributing to the ability to win at major band competitions as DeMatha continues to do. Pictured above are Ted McWithey (left) and Graham Lovely (right), two of the deserving students who now have the opportunity to use the new instruments. Both students do well academically in addition to their passion for music. Graham Lovely is an accomplished musician and has been selected for the Maryland All-State Band or Orchestra for the past four years. He was also nominated to perform with the National Association for Music Educators All-Eastern Band, which is made up of outstanding musicians from the 11 Northeastern United States. Ted McWithey is also a talented musician in addition to being captain of the DeMatha Crew Team and an Eagle Scout. As for Graham, the new instruments have made his practicing much more enjoyable. DeMatha’s Wind Ensemble was named “The Outstanding High School Band in the United States” by the National Catholic Bandmaster Association 18 times! We were glad to provide the new instruments and hope that the Wind Ensemble continues this winning legacy. At Phillips Charitable Foundation we are advocates for a well-rounded education that includes a robust arts program. DeMatha Catholic High School, located in Hyattsville, Maryland, received one of our eight performing arts grants awarded in 2018. Performing arts was the focus for our 2018 Mission-Focused grants.